Think surveillance and communications privacy law is bad now? Just wait until the military’s “bioreactive taggants” and “smart dust” migrate back to the United States, and end up in the arsenals of the FBI, DHS, DEA, ATF, LAPD, and NYPD. That day will come, and we couldn’t be lesser prepared. I spend a lot of my time worrying about how we can successfully grapple with the privacy impact of technologies like face recognition, already in widespread use and growing in significance by the day. But we still haven’t appropriately dealt with the shift from analog to digital. In 2013, more than a decade after the dot com boom and bust, we still don’t have across the board standards requiring law enforcement to get warrants before reading our emails. Protections for our metadata — records about our communications, such as who we talk to, where and when — are effectively nonexistent, from the NSA all the way down to your local prosecutor’s office. And it’s about to get a whole lot worse, fast. We are about to enter yet another brave new world of technological change, and we are not even close to ready. 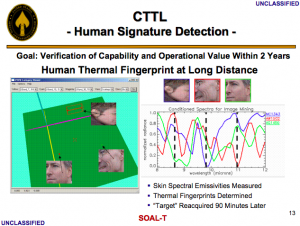 Click here to see the entire Special Operations Command powerpoint presentation on CTTL. There’s also ‘smart dust’ — tiny computers that pack processors, power and wireless communications into technology the size of a grain of sand. Good luck finding one of those in your car, placed just so by an FBI agent grateful you left your window open a crack. It should go without saying that tools like these, developed by the US military at a cost of untold hundreds of millions of dollars, will migrate back to the United States for use by domestic law enforcement and intelligence. Tracer Detection Technology Corp. marks targets with a paraffin wax crayon, filled with a perfluorocarbon, a thermally-stable compound used in everything fromrefrigerators to cosmetics. The perfluorocarbon’s vapor can then be tracked with sensors, such as a gas chromatograph. The smell lingers for hours. Think locking yourself in a room with the windows closed or removing the tag will help? Too bad, you still reek. According to a research report submitted to the Justice Department (.pdf), the perfluorocarbon tracers can “permeate closed doors and windows, containers and luggage,” and even give you away for a while after a tagged item is removed. If you thought working metadata into Fourth Amendment protected space was hard, imagine trying to get a warrant requirement for electromagnetic tracking, or any of these other almost alien technologies. We have a lot of work to do if we want to avoid living in a dystopian nightmare powered by miniature, bug-sized drones and invisible tracking ink. The nanotech revolution will require a privacy evolution alongside it, but our related laws are still stuck in the big hair era. Putting our heads in the sand while the military and the FBI develop yet more invasive and powerful surveillance and tracking tools is a good way to ensure that the power inequities and extreme state secrecy we are experiencing today only metastasize. Tinkering around the edges is not going to cut it — and waiting around for the Supreme Court to bestow us with rights we deserve is not advisable. So how do we reform the law? Europe’s privacy model is an interesting place to start. Ultimately, we need overarching, broad privacy reform that takes into account these technological advancements and the ones coming down the pike — and something with teeth. But in order to achieve any kind of systemic reform, we need to first overcome an ideological hurdle. Enough with the technological utopianism. Technology can help us do really cool stuff, but it can also hurt us — badly. Before we can reshape our privacy law for the 21st century and beyond, we have to come to terms with this basic fact. Getting congress to listen to us won’t be easy, but we’ve done it before, and we are in as good a spot as we’ve been in decades to push for real reform now. Let’s strike while the iron is hot. The future belongs to all of us, if we will it.